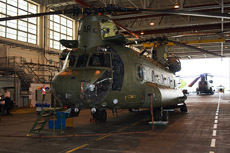 Today a visit to RAF Odiham was on the program after three successful days. 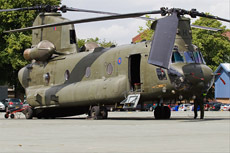 This base is the home of the British Chinook fleet and there are three active squadrons on it. During the afternoon we would visit RAF Odiham with the purpose of photographing several Chinook helicopters. 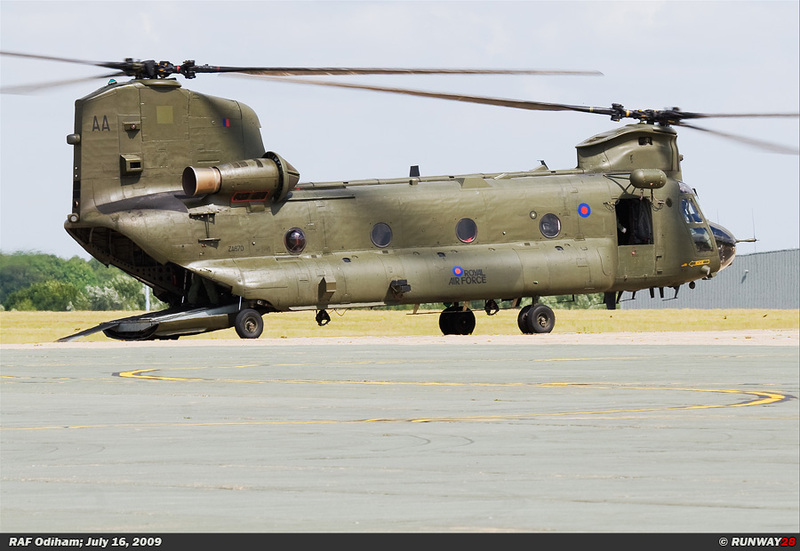 The Boeing CH-47 Chinook is a tandem rotor helicopter used by the RAF to lift some heavy loads. The tandem principle means that the helicopter has no tail rotor, but two main rotors which rotate in an opposite direction compared to each other. The British variants of the Chinook are based on the CH-47 Chinook of the United States Army. 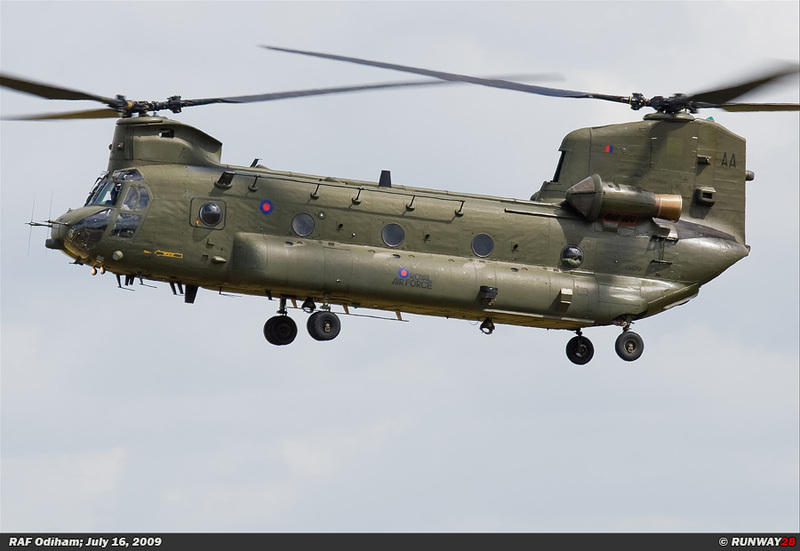 The RAF has a fleet of 48 Chinooks and is the largest user of this type with exception of the United States Army. 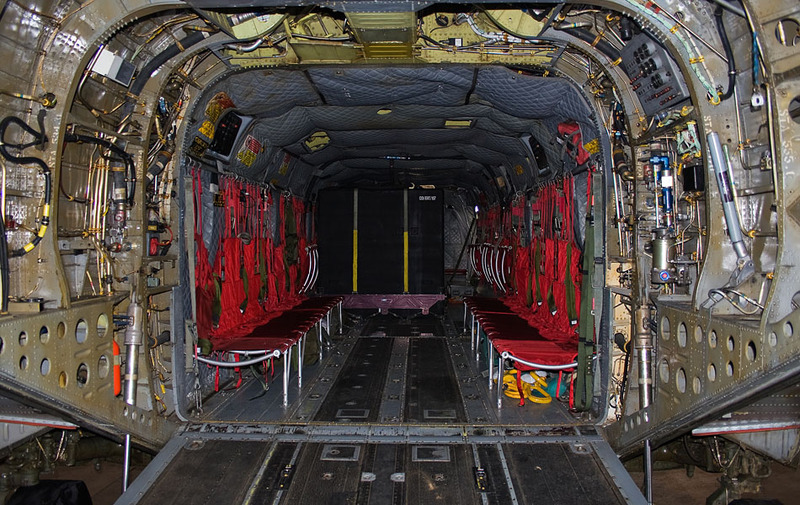 The British Chinooks have been used widely in many theatres of operation all over the world like the Falklands War and various peace keeping missions in the Balkans and the Gulf War. 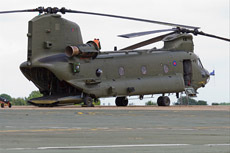 Odiham is the only base in United Kingdom where the Chinook is based. 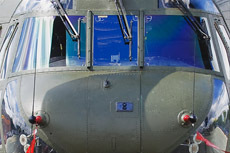 It houses up to three operational squadrons who fly the Chinook, namely: no 7 Squadron, No 18 Squadron and No 27 Squadron. Furthermore at Odiham there is no 657 Squadron of the Royal Army which is equipped with the Lynx AH7. 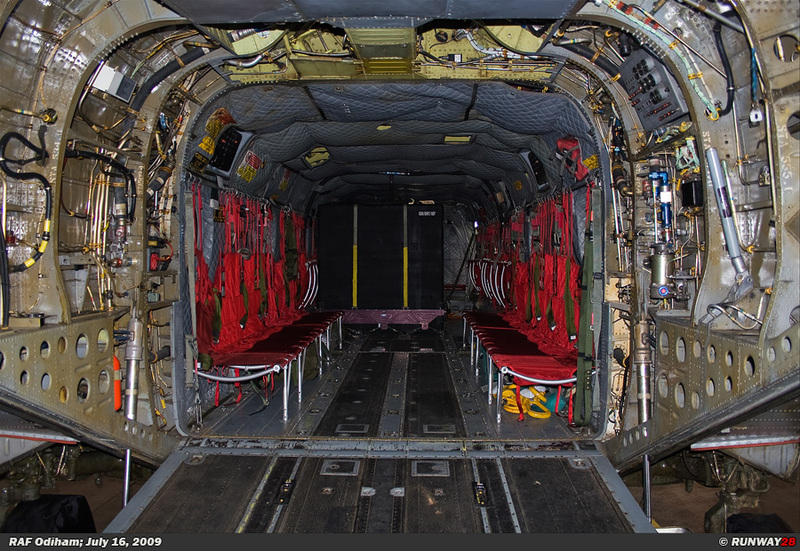 At the beginning of 1962, the CH-47A Chinook entered service at the United States Army. 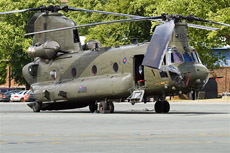 The Chinook was the successor of the Bristol Belvedere in 1969 which was also a tandem rotor design. 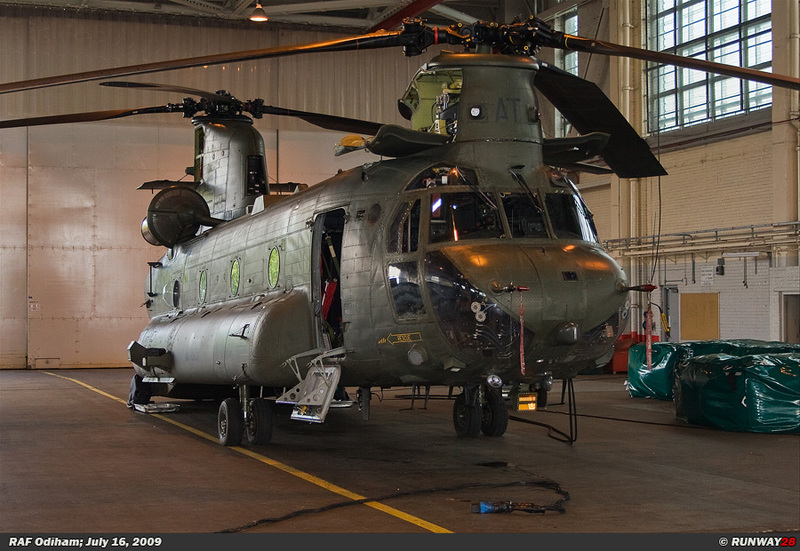 Like the Americans, also the Brits were looking for a heavy weight helicopter with some heavy lift capacity. 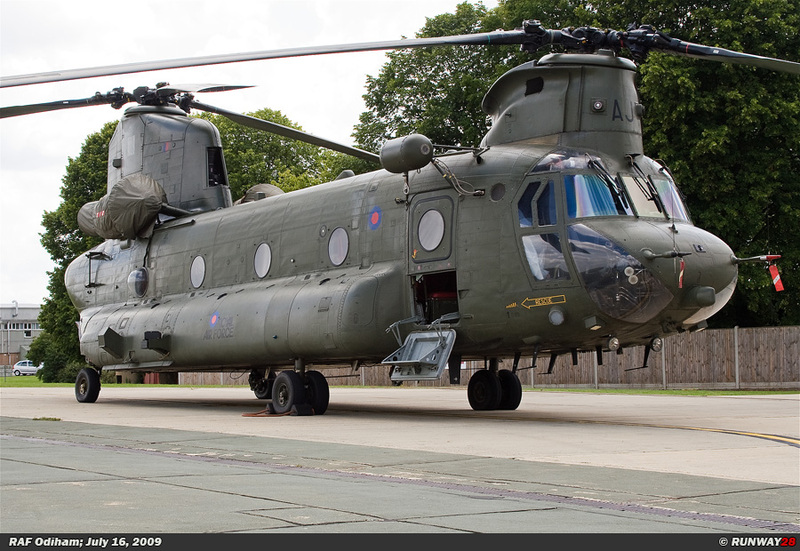 This resulted in 1973 in an order of 33 Chinooks of the Chinook HC1 type. 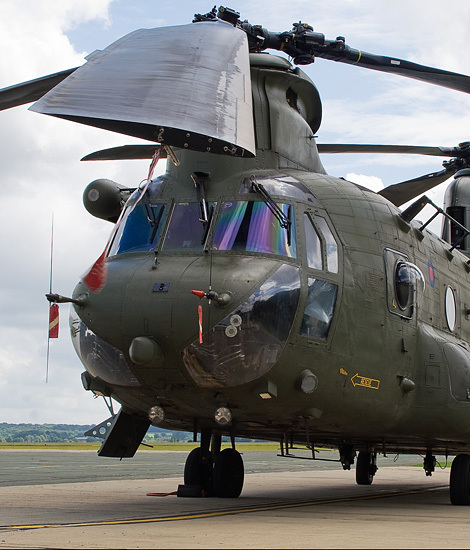 The first of these British Chinooks entered service in 1980 and they were similar to the American CH-47C; these helicopters were equipped with two Lycoming T55-L-11E turbo shaft engines. Between 1984 and 1986, another eight additional Chinooks were added to the British Chinook fleet. These were also of the HC1 type, but they were similar to the American CH-47D standard which is equipped with Lycoming T55-L-712 turbo shaft engine. 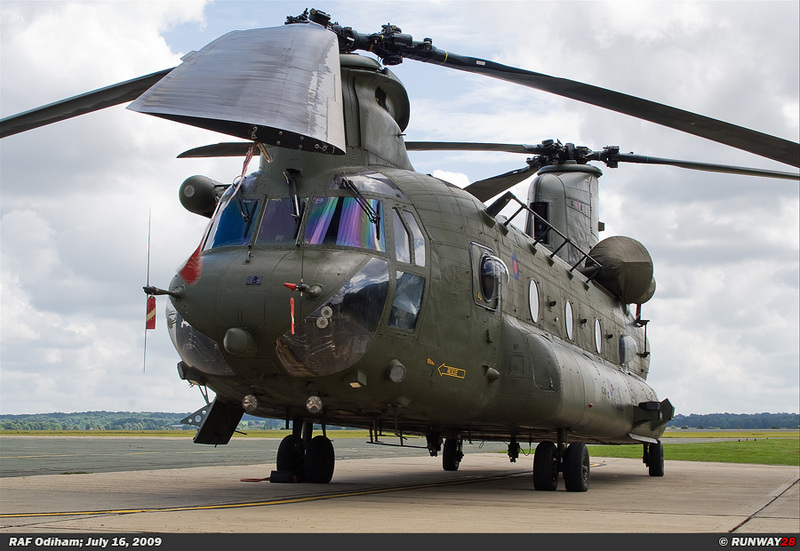 By replacing the metal rotor blades by rotor blades made of glass fibre, the Chinook HC1 was renamed to Chinook HC1B. 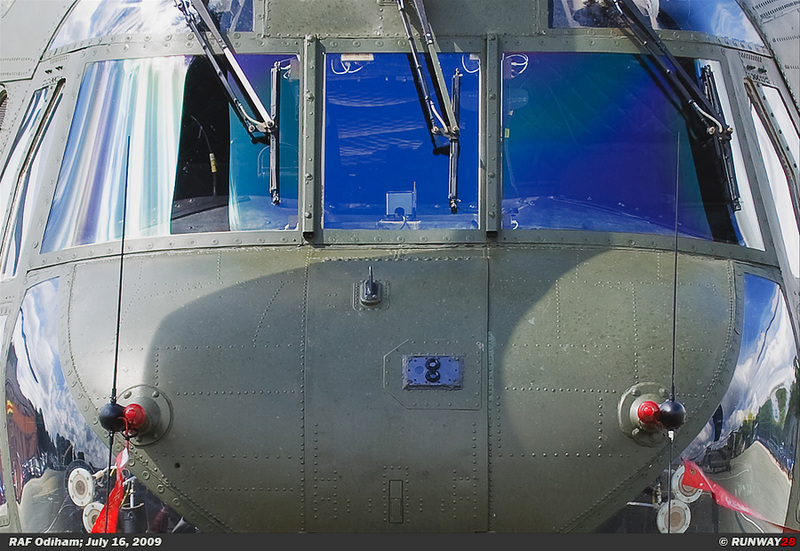 The next generation CH-47D Chinook entered service in 1982 in the United States Army. 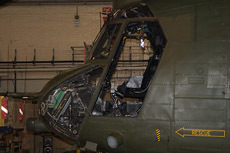 It had compared with the CH-47C rotor blades made of glass fibre, better engines and a completely new designed cockpit to reduce the workload of the pilots. 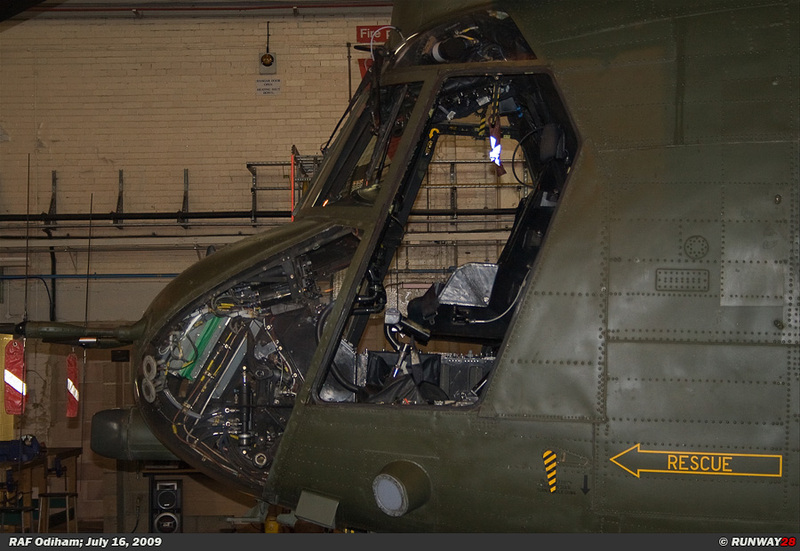 Furthermore, also some improved and redundant electronics were built in the Chinook from now on and it carried an Advanced Flight Control System (FCS) with improved avionics. 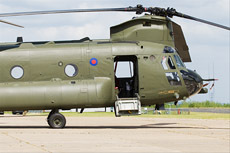 Also the British Chinooks were upgraded to this American standard, they returned to Boeing where they received their update to the CH-47D standard. The first of these modernized Chinooks came back in the United Kingdom in 1993. These modernized Chinooks were designated as the Chinook HC2. 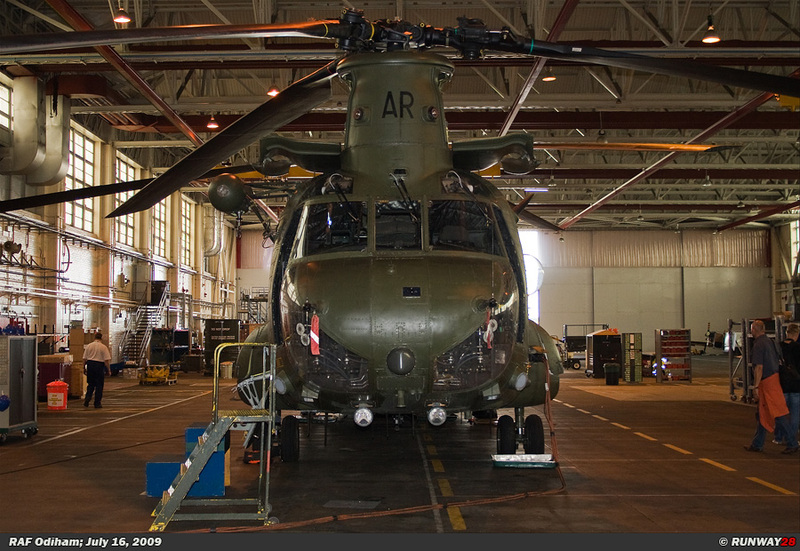 In 1995, three new Chinook HC2's were added to the British Chinook fleet. Also eight more Chinooks were ordered in 1995 with a stronger fuselage and a tank tube at the front of the helicopter for air to air refuelling. 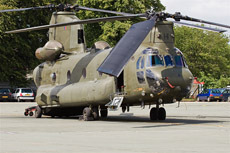 Later on the British government decided to order eight Chinooks of the HC3 type instead of the eight Chinook HC2A's which were ordered in 1995; these Chinooks were ordered for the British Special Forces. 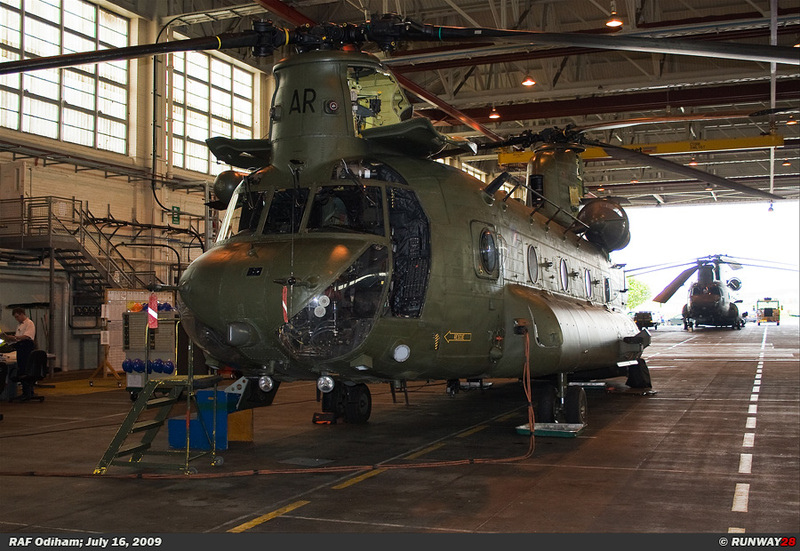 But now in 2009, these helicopters are still not delivered to the RAF. 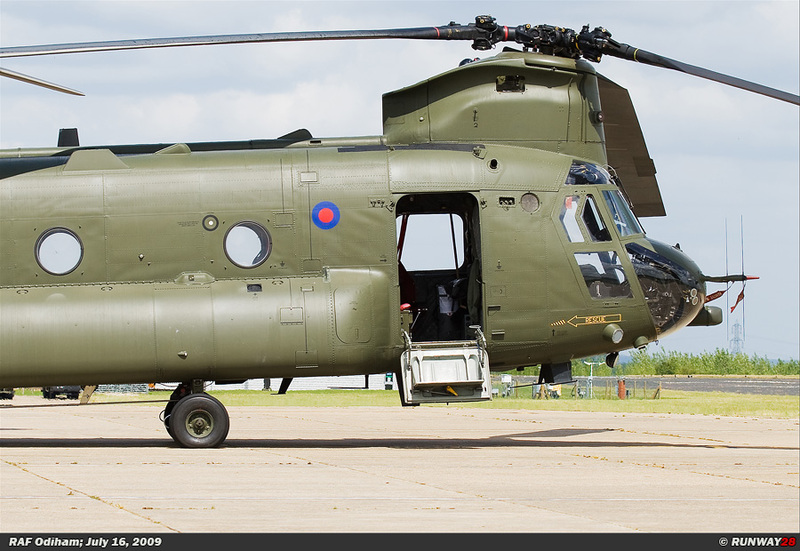 The Chinook HC3 is an efficient low-budget version of the American MH-47E Chinook variant. The HC3 will be equipped with improved night vision goggles and better navigation capabilities. 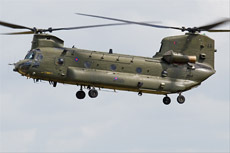 Eventually only six out of eight of these Chinooks will be delivered in the near future because of politics and budget. 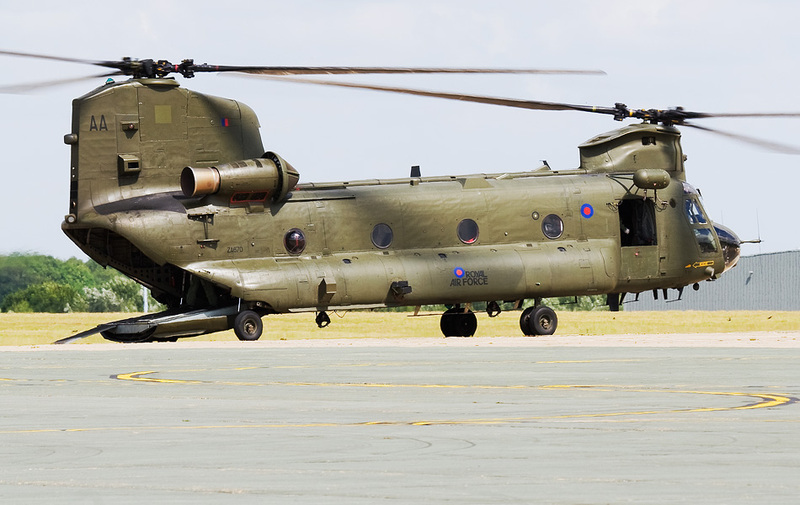 At RAF Boscombe Down, eight normal Chinooks are currently under modification for special ops tasks because the British Special Forces still need these special Chinooks. When I arrived at RAF Odiham, it was already 1 pm. I had to report at the main entrance of the base; this wasn't difficult to find because there is just one entrance at RAF Odiham. 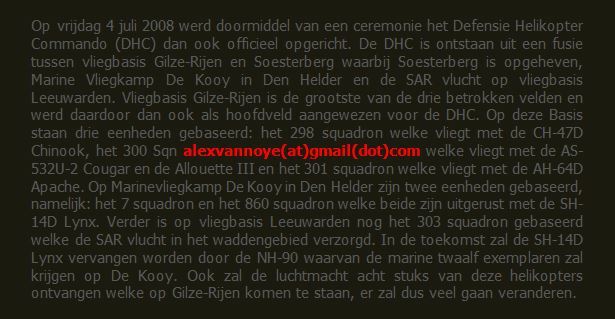 Our guide during the visit was a Dutch Chinook pilot who is based at Odiham for a period of two years; he was there in the context of an exchange program between the British and the Dutch. After a short introduction in the briefing room of the base, we finally went under his guidance to the platform. 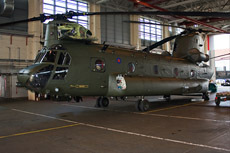 Once arrived at the platform we saw three Chinooks in front of the hangars. 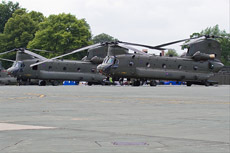 One of them was parked in the corner of the platform and was full with covers We all went towards the maintenance hangars when the Chinook was landed. 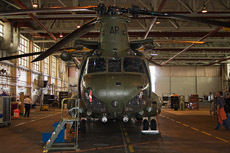 We found a few Chinooks inside the maintenance hangar and some technicians were working on the helicopters. 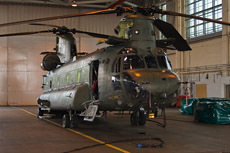 We were allowed to take pictures of all the Chinooks inside this hangar; not al Chinooks were parked in the best position for photography like always in a hangar. Our guide told us that updates are going that fast nowadays that not all Chinooks are updated to the same standards. At this moment there are seventeen different variant of the Chinook in British service, also because of deployments to Afghanistan and Iraq. After a visit to the first hangar, we went to the second hangar. After a visit which took more than three hours at RAF Odiham, the visit was over. 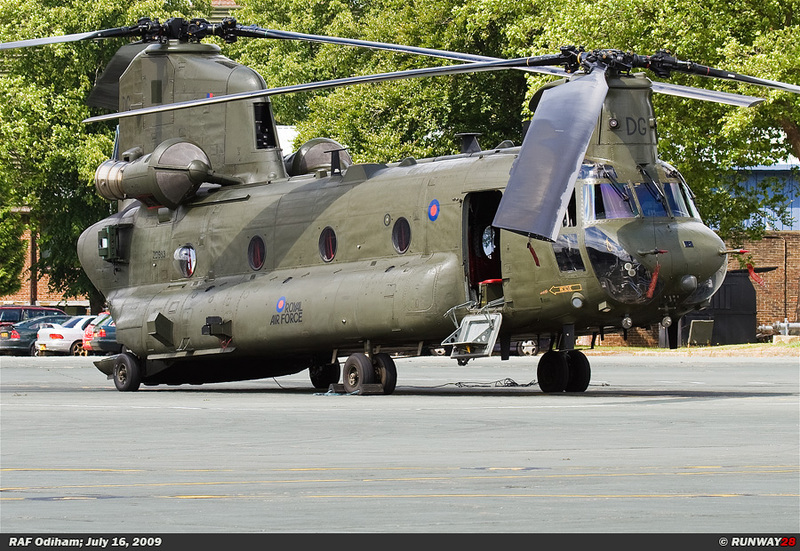 I left Odiham with a lot of Chinook pictures on my photo cards. After my visit to RAF Odiham, I left the UK for two days and went home by plane via the airport of London Luton; the reason for this was personal. The next base visit would be RAF Fairford on Sunday the 19th of July where I would visit the Royal International Air Tattoo. Unfortunately we were not allowed to have a look at the based Lynx unit at Odiham. This because there were some special Ops going on at this unit and for safety reasons it was not allowed taking pictures of these soldiers who were active over here. After a relatively small but interesting visit I left Odiham by car. RAF Odiham was not the most active base which I visited in the United Kingdom, but I took some decent photographs at this base.